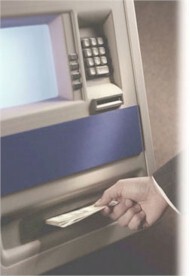 ...the Automated Teller Machine (ATM) ? There was a time you could put any deposit in the envelope. I remember in 1976 making a deposit of $10 in nothing but various coins. Now Chase doesn't even bother with envelopes! I use 'em alot, they're a godsend. In the late 1970's, Wisconsin introduced ATMs as "TYME" Machines (Take Your Money Everywhere), and thus rather than use the term ATM, everyone just referred to them as "time machines". This was a cruel trick. In Wisconsin, when someone was asked, "Where is the nearest time machine? ", they were pointed to the nearest ATM machine. Outside Wisconsin, the question "Where is the nearest time machine? ", got very strange looks and a wide variety of answers, none of which were helpful.